Spain’s large and vibrant capital city has so much to offer, from world famous museums to centuries old architecture and mouth-watering gastronomy. 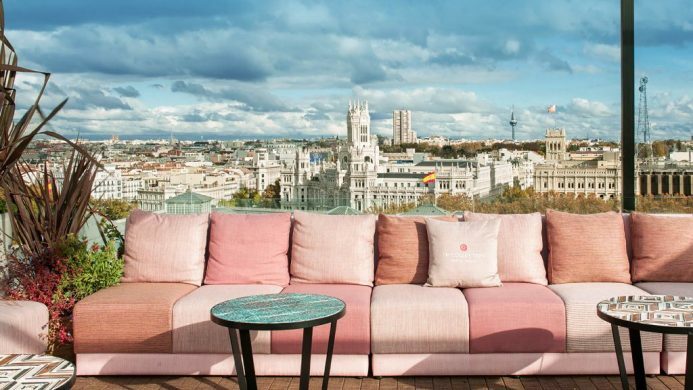 In part two of our series, we highlight our 5-star hotels in Madrid, each as captivating as the city in which they call home. 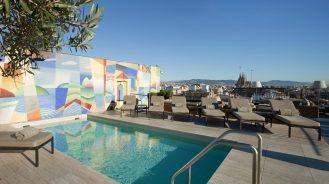 Located in the trendy Salesas neighborhood, Only YOU Boutique Hotel is one of the most stylish boutique hotels in Madrid. 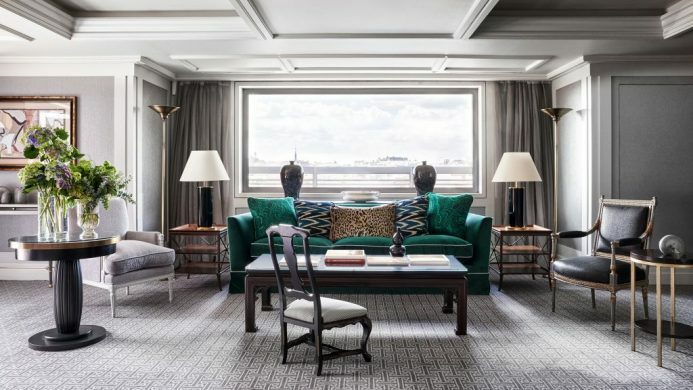 This former palace has been transformed by designer Lázaro Rosa-Violán, featuring award-winning interiors inspired by the cultures of the world. 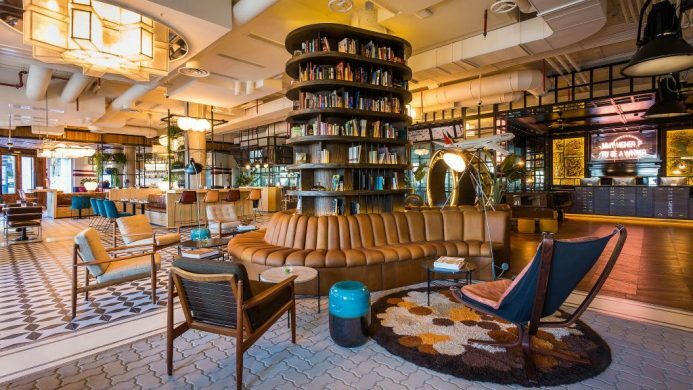 There are also loft-style rooms and lively eateries, including a unique bookshop and gastropub in one, as well as a Thai-inspired spa. Housed within a 19th-century palace, Gran Melia Palacio de los Duques guarantees a stay that is nothing less than royal. Inside its Elizabethan façade are interiors inspired by the painter Diego Velázquez, giving the hotel an arty, aristocratic flair. Reserve a table at Dos Cielos, which features iconic dishes by the famous Torres brothers. NH Collection Madrid Suecia boasts a storied history; it was once the Madrid home of Ernest Hemingway and Che Guevara. Today, it’s a modern and charming hotel in the historic center, complete with bright spacious rooms and sweeping views. To top it off, there’s a rooftop bar where you can sip cocktails while gazing at the city and mountains beyond. 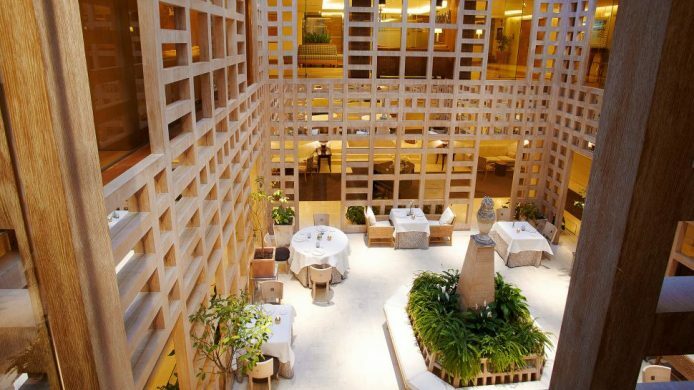 On Paseo de la Castellana, Hotel Hesperia Madrid offers luxury surrounded by exclusive shopping and dining. Home to the two Michelin-starred Restaurante Santceloni, this Pascua Ortega-designed hotel is a destination in and of itself. After dinner, retire to the Scotch bar or work it off at the fitness center overlooking the city skyline. 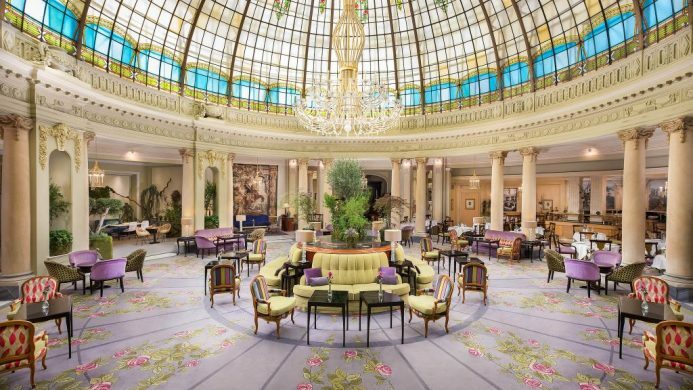 Originally commissioned by King Alfonso XIII, The Westin Palace Madrid is a heritage site and cultural landmark. This opulent hotel features modern rooms, fine dining and resplendent architecture. With its location along Madrid’s famed Art Walk, you’re just steps to museums such as the Reina Sofía and El Prado. 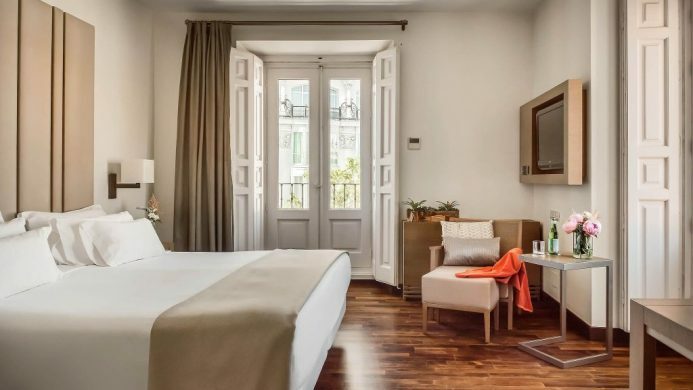 Hotel Villa Magna may be the most elegant address on Paseo de la Castellana. Once a Moorish-style palace, the hotel was given a sophisticated, modern aesthetic by designer Thomas Urquijo. There are timeless rooms and suites with muted tones, a year-round patio for soaking up rays and numerous luxury shops at your doorstep. Opposite the Puerta do Atocha rail station, Only You Hotel Atocha blends urban style with industrial charm in the heart of Madrid. This trendy oasis is thoughtfully designed for the modern lifestyle. 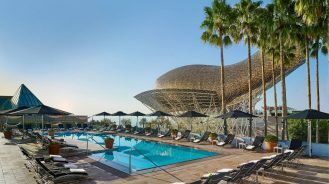 Feast on daily brunch, stay fit with the running group and mingle in the ample social spaces, such as the roof terrace or in-house bakery. 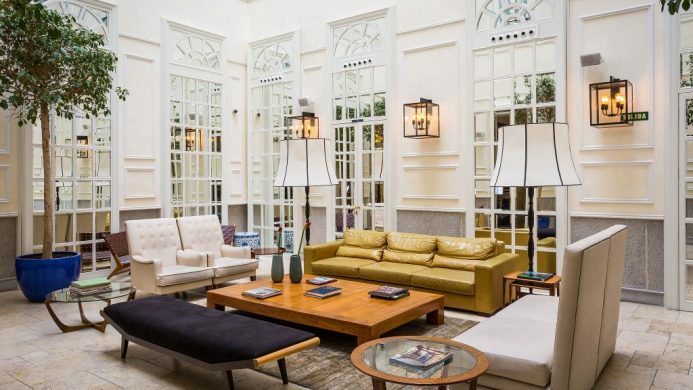 Designed by Juan de Villanueva, architect to the Prado Museum, and decorated by award-winning Ramón Esteve, NH Collection Madrid Palacio de Tepa is a gem tucked in the literary district. It’s home to cozy rooms flooded with natural light and a restaurant overlooking the street. Meanwhile, a short stroll takes you to the Royal Palace, Royal Theater and Plaza Mayor. Hotel Urban is unarguably the most unique hotel in Madrid. 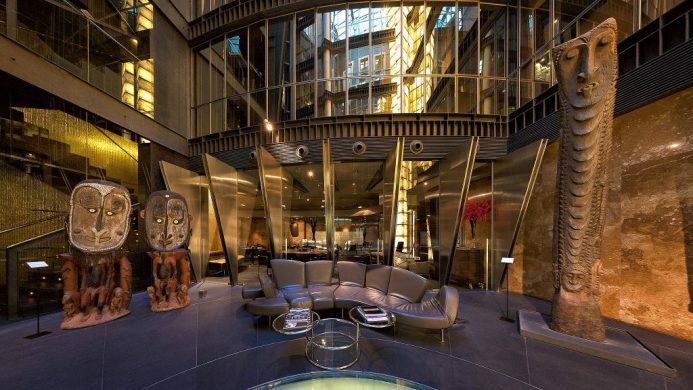 This striking property features Art Deco-style interiors within an avant-garde building. It’s also home to an extensive artifacts collection on display in the on-site gallery, and throughout the rooms and common spaces. Not to be missed is the restaurant CEBO, recently awarded its first Michelin star. ME Madrid Reina Victoria combines innovative design with great music. This fashionable lifestyle hotel boasts rooms and suites with floor-to-ceiling window views and a restaurant serving Mediterranean-style haute cuisine. 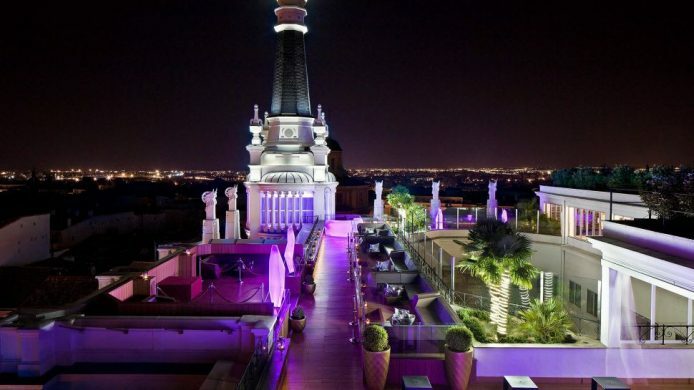 However, the hotel is most famous for its expansive rooftop, where live music events meet 360-degree views.